A mild El Niño condition is developing in the Pacific Ocean, climate experts said Friday. El Niños can affect weather in other areas, sometimes worldwide. "El Niño conditions have developed in the central tropical Pacific and are expected to last through early 2005," Jim Laver, director of the federal Climate Prediction Center, said in a statement. These conditions occur when ocean waters become warmer than normal for the area, causing an increase in cloudiness and affecting air pressure and winds as well. The classic area for El Niño conditions is farther to the east, near the coast of Central and South America, and the agency said it did not yet know if that region also will be affected. The National Oceanic and Atmospheric Administration agency said it will continue to monitor the situation in the tropical Pacific. The climate scientists said sea surface temperatures were more than 0.5 degrees Celsius (1 degree Fahrenheit) above average in the central and western equatorial Pacific during August 2004, the third month of warmer-than-normal readings. While the current warming indicates the early stages of an El Niño, the conditions have not spread oceanwide, which means it is likely to be weaker than the 1997-1998 event, the agency said. 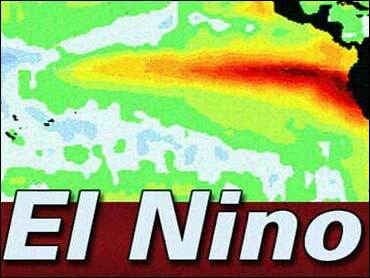 El Niños occur about every four to five years and can last up to 12 to 18 months. The effects can range from drought in Indonesia, Australia and Africa, to storms in California and floods elsewhere. The 1997-98 El Niño caused an estimated $20 billion in damage worldwide.